Last night I had contacted Cristobal from warm showers, asking if I could borrow their bed for the night. Unfortunately, when I checked my emails, I saw that the message hadn’t sent. Instead of sending another, I changed my destination to Lüneburg. Around 60-70miles in what was going to be another 30°c day. When I was in Denmark, I had asked a local whether it was always this warm here. “Normally it will be hot for one day, then miserable for 10 days. This is very unusual”. I was glad it wasn’t just me! After my second cup of tea of this trip so far, kindly made by my Italian neighbour, I set off knowing I had a long day in head of me. Without needed to stock up on food, it felt like I travelled quite far in the morning. The roads were flat and fast rolling. I could feel Spain getting closer and closer. The good luck didn’t continue for long…As I climbed into a small, pretty village, I heard a snap sound from the bike. It was fairly quiet so wasn’t sure if it was the bike or a twig I’d ridden over. Hoping it was the latter, I stopped to check the bike over just in case , but everything seemed to be in order. About three miles on, I had a nightmarish thought, what if it was the spokes again? I hadn’t actually checked them since Unda Campsite in Sweden. Some spokes seemed slightly loose but not too bad. That was untill I noticed one of the spokes had broken! I didn’t think I was going to have anymore spoke related problems this trip. On a positive note, which it was hard to find, at least the wheels wasn’t wobbling and buckled compared to before. Though when I put the rear brakes on, I could see them frantically moving from side to side. As there weren’t any bike shops nearby, the only thing I could do was to continue cycling. I had already done quite a few miles so thought ‘what else could possibility go wrong, a puncture?’ It turns out no, worse. 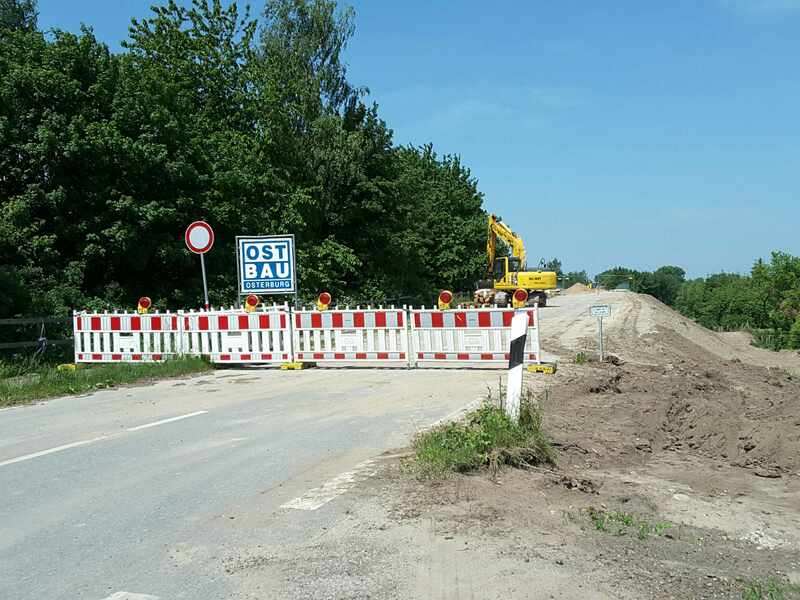 I had stopped at a small store to buy a snack and saw a ‘road ahead closed’ sign (in German!). However, I couldn’t see anything wrong and it was Saturday, so carried on the road. About five miles on, I came to the road works, completely blocking the road. Normally I would try and walk past the road works, pushing my bikes along. However, the works were building a new bridge, thus making walking an option! On the map I could see a forest path, about a two mile detour but could bypass this, meaning I didn’t have to retrace my journey. The forest track started well but soon stopped and turned into a muddy footpath, which eventually disappeared! Without Jilly the garmin, I probably would still be in the forest! About half an hour later I emerged from the forest, bike covered in mud, especially the brakes. I doubt this was helping my broken spoke! A few towns I came across had bike shops, where I crossed my fingers they would be able to help. However, 3pm on Saturday isn’t the best timd to get a wheel fixed here in Germany. Most shops were either closing at 3pm or had already closed at 1pm. Tomorrow was Sunday which made it exceptionally worse. Giving up on finding a bike shop, I carried on, trying to concentrate on reaching Lüneburg. I nearly passed Santens 2 Rad bike shop without noticing it. The time was nearly 4pm but still I wanted to try. Inside, the owner said he was closing in 15 minutes but would certainty have a look. 30 minutes later I had my bike back, not only with a new spoke for the wheel, Peter Santens had also put in several new scews and made another hole for the rack. I was a little nervous when I saw him drilling into my frame, but it was soon sorted. All this time I was wondering what the cost would be, knowing how much it was back in sweden, and this time it was twice as much work. The price for all of this? €5! Peter Santens was an ex-professional cyclist from Belgium, riding internationally, even in the Tour of Britain! He certainly knew how to do his mechanics. If you are ever in Geesthacht, Germany then definitely give Santens 2 Rad bike shop a visit, it won’t disappoint. I missed the campsite turning a few times, but finally arrived. Being the weekend it was full of families making use of the good weather. It was on the edge of a forest so lots of flies and insects. I was just glad I could keep going, on a bike that will hopefully get me to Spain.